If we do not embrace the faith whole-heartedly, with that spiritual hunger and thirsting, as we hear in the Beatitudes, and live it out in our lives, there is no point in celebrating the feast today. Last Sunday, the first Sunday after Pentecost, we celebrated the Feast of All Saints. We asked the question, “What makes a person a saint?” We talked about how saints are consecrated, set apart for the service of God, and no longer focused on worldly purposes. We looked at the icons, and the saints we see there, in our family picture album, and our church “hall of fame.” The conclusion was that they yielded themselves to the Holy Spirit, and so were set apart, consecrated to God – and that each one of us has received the same Holy Spirit, and that we are meant to be temples of the Holy Spirit, to minister to the needs of others and to proclaim the good news of our deliverance from death by our Lord Jesus Christ. 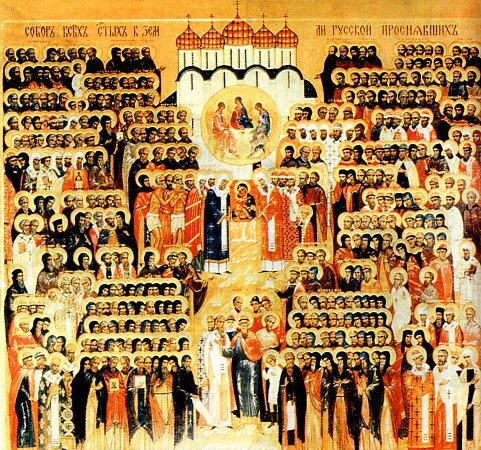 We are all saints; and we are all meant to be “Saints,” in the way that we talk about those whom we remember, who we venerate through their icon. Today we celebrate the Feast of all the saints whose light has shined upon us from the land of Russia, from the time of the baptism of Russia in the year of our Lord 988 through trials and invasions and wars, to those who are among the new martyrs and confessors, some of whom suffered and died during our own lifetimes. It took almost a thousand years for the good news to reach Kievan Rus’; it took another 800 years to make the journey from there across the steppes and the taiga to the western shore of the Pacific Ocean, and then, from the port city of Saints Peter and Paul, to come to Alaska, and down the west coast of the North American continent, in the year 1794. The faith was carried across the Russian land, first by monks, who fled from cities and towns and villages to struggle in the wilderness; and then by others, who formed small sketes, and then monasteries. People began to move nearby, and settlements became villages, and then towns, and then cities; and so monks would again flee further east, into the wilderness, starting the cycle again. Time and again, the Orthodox faith was embraced by the people who heard the Gospel as the roving monks came their way, and so the Church grew, and her influence spread. Many miracles were performed, many people were healed, and many, many more were protected and comforted in troubled times. We could speak for hours on end about the many wondrous saints who lived in Russia, and not discuss them all – to say nothing of those whose names and circumstances are known to God alone, in Whose presence they dwell. It is good for us to remember and to celebrate this heritage, this great treasure, this inheritance that is ours in the Orthodox Church that is Russian in its background and practice. But, like a buried treasure or an unclaimed fortune, we gain nothing from this inheritance that has been given to us if we do not claim it as our own, and put in on, so to speak, and wear it, and use it, and show it forth in the world as so many of the saints who have gone before us have done. If we do not embrace the faith whole-heartedly, with that spiritual hunger and thirsting, as we hear in the Beatitudes, and live it out in our lives, there is no point in celebrating the feast today. If we do not draw near to the faith, as did those who lived next to the monasteries did, there is no point in celebrating the feast today. If we do not flee from the cities of the world, so that we can put aside the temptations of the world and draw closer to God, as did so many monastic saints in Russia, there is no point to celebrating the feast today. And if we are not willing to undertake the ascetic labors needed to transform us, so that we, also, may draw those living in a world of darkness to the light of the life of Christ in us, there is no point in celebrating the feast today – for if we will not do these things, then we do not value the saints who have arisen in the Russian land. Brothers and sisters, let us pray that God will bless us with grace and strength to learn and follow the examples of saintly living given to us by all the saints of Russia, that we may join them in glorifying God, and to making known to our land, as they did in theirs, the good news of our salvation in Jesus Christ our Lord. O all you saints of the Russian land, pray to God for us!